It’s one of our favourite nights of the year: the Georgie Awards. Our clients did well this year: a large percentage of our entrants made it to the finals, and a couple of them took home some nice golden hardware! So, who won? This project not only oozed architectural cool, it pulled off the clever feat of packing in at least separable units (three in the main house as an n-plex, plus a clever laneway that I wish I could move into…) onto one property while fitting into the scale of its mostly-smaller-residential Renfrew Heights neighbourhood. 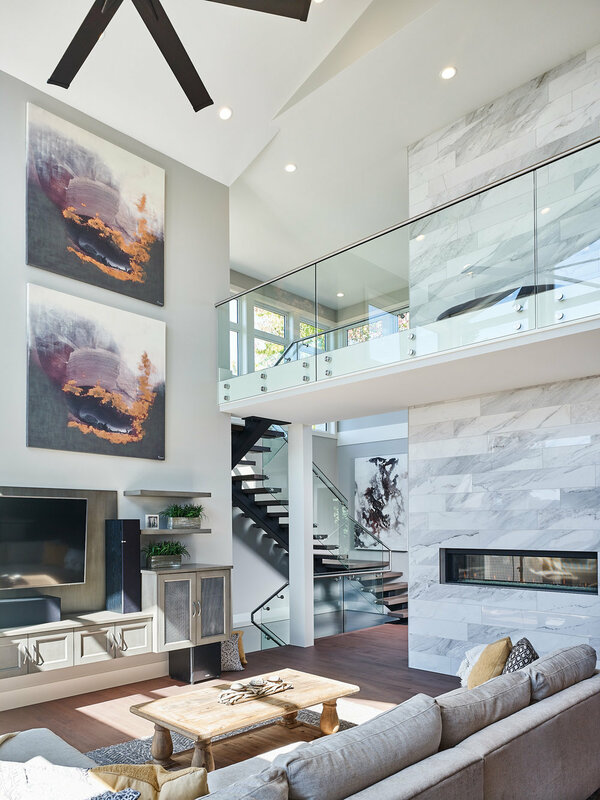 This project was a finalist in the Ovation Awards last year (for Best Small-Scale Home, Best Townhouse/Rowhome, and the BC Housing Award for Excellence in Innovative Housing). This “gentle density” approach gave it Best Multi-Family Townhouse (Infill; 6 Units and Under), and placed it as a finalist for Multi-Family Kitchen New and Custom Home 500-899K. Congratulations to Babak, Nick, and the crew at Project Mint and Nick Bray Architecture! We’re big fans of great renovation projects—as much as we love that new-home smell, there’s something special about photographing a project where you just see all the love and care that has been put into customizing a place specifically for its occupants…as well as packing in plenty of energy-efficient healthy upgrades. This was certainly on full display with this extensive Langley renovation. In addition to having an absolutely gorgeous kitchen/great-room with all the fixings—and a stunning view over the Fraser River and up to the North Shore Mountains, this renovation was full of features made just for the family who owns it. The owners’ Manx cats even got their own features, with built-in cat doors in the ensuite to hide the litter box (and let’s not forget: mounting the toilet paper holders at a 45 degree angle…you fellow cat owners know the utility of that!). To top it off? The two kids’ bedrooms, each featuring ladder-accessible lofts, including a boy’s room in an absolutely stunning Star Wars theme complete with a light-up Darth Vader to greet you. The judges loved this project as much as we did, handing it the Best Kitchen Renovation Over $125K and Best Certified Whole House Renovation. 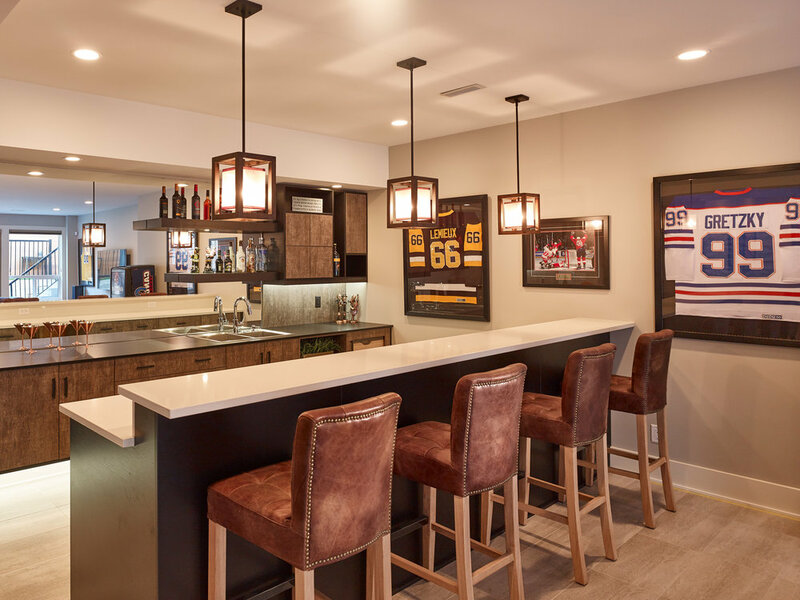 Cheers to the My House Design/Build Team! Get HPO CPD, IDIBC CEU, and AIBC LUs ASAP. OMG, WTF? Now that was a mouthful of abbreviations, wasn’t it? And if none of it made sense, you can mosy on now and get back to your Boxing Day festivities, shopping, or whatever else you’re doing. As for the rest of you: you read that right. We’re now offering continuing education courses for those of you who need to get credits—and those of you who are just plain curious. It’s Ovation Awards season, and if you want to participate and haven’t gotten around to getting your entries together...well, here’s a gentle nudge to get with the program! Use code BoxingWeek at checkout to get your discount (it’s good until December 31). This CEU is a soup-to-nuts look at specifying architectural and interiors photography: how to choose photography, get it scheduled, get everything prepared onsite, work more effectively with your photographer to get the results you’re after, and share the load with your trades so everyone gets the images they need. We can schedule this as a free lunch and learn for you and your team if you’re in the Vancouver area. If you’re working on your own, we’ll be presenting this as a lunch event later in the year. Drop us an email or call us and we’ll schedule it up for you! We shoot almost all our work tethered (i.e. directly to a laptop, on location). It’s not just a great way of making sure that we have everything right on location and that everything worked, but it’s also become an indispensable part of our workflow and creative process. When a draft of the image we’re producing comes up on a big, bright laptop screen, it’s a good way to get other people on site involved. We love this kind of on-site collaboration—there have been many, many images that have been made so much better by us lining up an image, and an architect or interior designer noting “hey, I have an idea for making this even better”, us putting it in place together, and then making a few more creative improvements to really make the image sing. At the end of the shooting day, everyone knows they got the images they need, and we all go away happy. It’s a win for everyone. But there’s one little problem: we like to move pretty quickly on site, and because we often work in small spaces (it’s Vancouver, after all…), lugging a laptop around on site can be a real pain because there’s nowhere good to put it. The standard solution to this has of course been TetherTools’ plates that are designed to mate your laptop to a lightstand, but this doesn’t make the problem go away: in fact, it makes it worse because when you have to move that lightstand around, that’s more opportunity for your expensive laptop to come crashing down, ripping the wiring out of your camera and causing everything to come to a screeching halt…a risk we really, really don’t like. (Thankfully, it’s never happened, but it’s a fear we live with). Surely there has to be a better way: why can’t someone come up with a way to securely hold a laptop, and ideally do it in a way that we can just attach it to a tripod and get on with life? You’ve been able to do this with an iPad or Surface for ages, but we wanted the speed of wired tethering (scratch the iPad), and didn’t really want to deal with administering a finicky Windows machine that’s going to decide to install updates in the middle of your shoot. (scratch the Surface). While we’ve for years suffered with dragging a MacBook Air along in a Thule semi-hard case to protect it from the elements (and since I’m usually in socks on location, hitting shortcut keys with my toes), when Apple came out with the 2018 MacBook Pro’s, we decided it was time to upgrade to a 13” MacBook Pro, which is both physically smaller than the old Air was (it positively swam in the old Thule case), and approximately the same weight. Chalk one up for Apple’s thin-and-light obsession. The only thing left was to find a way to rig this onto a tripod securely, so that when you move the tripod, the laptop comes with (and you don’t have to get your assistant to move the extra stand around). In an ideal world, the laptop rig should be relatively light, easy to grab and pull off the tripod where necessary, and be riggable with inexpensive grip—ideally, stuff that’s already in the gear crib so we’re not out a bunch of cash if it doesn’t work. Enter the Inovativ DigiPlate Lite, which seemed to tick all the boxes. That, plus a Magic Arm and a Mafer clamp (both of which we had in the gear crib), and we should have a tethering system that works, right? Asking Inovativ about this via email yielded dead silence, and the DigiPlate Lite is new enough that our friends at Capture Integration, while they list it as something they’d soon carry, didn’t have any information on it yet…so the only option was to go buy it and try it out. The idea is solid: take a film-style “cheese plate” design that’s customizable, and put solid clamps on either side so that your laptop is firmly supported to the plate, and then mount the cheese plate itself onto your choice of mounting arrangement. Inovativ gives you two “preferred” mounting arrangements, the DigiBracket (which hangs off your tripod), and the DigiBase, which gives you industry-standard 3/8 (or 1/4x20 with the usual reducing bushing) and baby-pin mounts. While in theory the DigiBracket is made for our usual use of direct tripod mounting, it mounts on the tripod by friction, which means you have to pull your laptop off it when moving your tripod around…and we move the tripod around a lot on location. The DigiBase got the nod, begrudgingly, because we figured that what we’d really want to do is just screw it right into the top of the Magic Arm and get on with life. We bought the DigiPlate Lite kit from B&H in late August, since they were the only ones who seemed to have it in stock. The DigiPlate arrives as a “kit of parts” vaguely reminiscent of a kid’s Meccano Erector set. Unfortunately, the kit we ordered from B&H was defective: we got no DigiClamps, and two DigiBases instead. So we got the RMA and, with the Jewish holidays approaching and B&H showing no other stock available, we reordered directly from Inovativ instead, shipping it to our US package drop. Thankfully the second kit showed up complete (as well as giving us an opportunity to order and try out the DigiHanger for extra cable support; B&H didn’t stock this either). You get a box with a lot of parts bags (which include various hex screws, thumbscrews, hex keys, washers, stick-on rubber shims, etc) and a few little sheets of documentation to get you on your way. The documentation for individual parts is just barely adequate, and a bit of extra guidance—possibly on video—would be really useful for getting everything put together quickly and giving you an idea for what you can customize. If you’re mechanically inclined, a lot of things are fairly obvious despite minimal documentation and assembly is a fun challenge, but if you’re the sort of person who has trouble assembling Ikea furniture, you’re going to want to give yourself some time to build everything. It took us an hour to get everything all set initially, with a few little tweaks after our first test run on location. The plate itself is designed to easily handle 13” and 15” laptops, and the clamps include a set of shims to deal with thicker laptops, and a set of rubber pads to hold everything in place. Inovativ intends for you to either keep the shims stacked up under a longer thumbscrew (which we’d do if we were teching and didn’t know what laptop would live on the stand at any given time), or use the smaller supplied thumbscrew and leave the extra shims in your gear crib (which is what we do). For a MacBook Pro 13”, the clamps are actually slightly too large to begin with, so we installed all the rubber pads, which locked the laptop down nicely. You have to install the supplied rubber padding on both the inside side, outside, and inside (two pieces go on the inside top, because the MacBook Pro 13” is thin). With all this installed, we’re pretty confident walking around holding the DigiPlate and knowing that the laptop is unlikely to slide out of its mount (and if it does, it won’t slide far anyway). One little quibble: that the clamps stick up a little high, so if something forcibly closed the laptop (or it dropped) and landed on the pads, we’d be very worried about a bent/broken screen. Inovativ stocks a set of ‘MacBook Air’ clamps, which with a shim or two would possibly be a better option for the new MacBook Pro’s. There’s no documentation on Inovativ’s site in this regard, so we don’t know for sure. (We’d be happy to test them if Inovativ shipped us a set, of course). With a 13” laptop, the ‘ears’ of the DigiPlate actually stand proud by a few cm’s on either side, which gives the impression that the plate is oversized for the job, which it is—making it more likely to bang the corner of the plate into something on location accidentally. Everything is very solidly built from hard-anodized aluminum (in fact, it’s a little heavier than we’d have expected it to be) and inspires confidence that it’s going to survive many, many years of getting banged around, dropped, and otherwise will survive the abuse that we routinely dish out to grip equipment on location…and probably look fairly new when it’s finished. In an ideal world, Inovativ would supply a set of ears just for 12”/13” laptops that are a bit more…form-fitting. However, the extra space gives you a good place to hang a DigiHanger, an accessory we’re glad we got. Since all of our tethering cables have Velcro straps, we’ve taken to hanging the Velcro straps off the DigiHanger, providing some strain relief, a very neat install, and drastically reduced likelihood of ripping a cable apart if something bad happens. (Inovativ shows a carabiner hanging off the DigiHanger, which we’d recommend if you aren’t already using Velcro ties on your cables). Sometimes we’ve just pushed the end of a USB tethering cable through (it fits, just), connected to a USB-A/USB-C dongle—which means that if the cable rips out, the dongle should take the force leaving the MacBook Pro’s USB-C port intact. Underneath it all is the DigiBase, a solid block of aluminum with a twist-preventing stud. This gives you a very deep baby-pin mount as well as 5/16 and 1/4x20 screw holes. It’s intended to be installed atop a light stand. There’s a major annoyance: the security screw seems to be placed too low for this to work well. On most of our stands (even the ones with built-in 1/4x20 screw tops), and on the Magic Arm, you have to lift the whole assembly up in order for the security screw to lock onto the thinner body of a baby pin spigot, which means it’s less secure and very prone to working itself loose. We’re constantly checking and retightening this screw as things move around on location. If we were using the plate atop a lightstand that doesn’t move much, this wouldn’t bother us nearly as much, but we’d very strongly recommend installing a spacer of some sort (a round rubber adhesive ‘foot’ or two carefully inserted into the bottom of the baby pin receiver would probably do it) if you run into this problem. We’d probably install one ourselves if we planned to keep using the DigiBase, but more on that later. It’s a nearly perfect one-tripod tethered capture setup. The 10” Magic Arm is a bit bigger than we’d like, but it provides a lot of support and means we can move the laptop to either side (or behind) the tripod easily and securely, making it easier for us as well as our clients to see what’s on the laptop. Clients have also noted how cool and convenient everything is, which is always a plus as well. We’ve been using this rig for both interior and exterior work on numerous locations for the last month, and it’s performed beautifully. Finally, we have a setup that puts the laptop at a good working height, holds everything securely, and really speeds up tethered capture on location because the entire laptop is within easy reach. Most importantly, the whole thing can be easily moved around by one person. I often find myself grabbing the tripod by one leg and the Magic Arm. This grip lets one person get around a floor, up and down stairs, and through some fairly marginal outdoor terrain (‘tis the season for wet dirt in landscape projects!) without any risk of pulled cables, and providing a lot of safety for all the gear. All that said, there are a few things we’d love to change. 1. Inovativ needs better pre-sale support! When you sell a system that’s this customizable, it takes a bit of research (and some “local knowledge”) to get the system you want (and for non-US folks, cross-border shipping and returns are a real pain so it’s important to get things right the first time). Most suppliers in both the photo and design industries (including us!) are happy to answer questions and make sure you get what you need. Inovativ didn’t answer email or phone calls, which meant we were on our own to figure out what was likely to work. Go hire some good people for this, Inovativ! You have a great product, and people are going to need a bit of hand-holding and documentation in order to get the best bits that will fit their needs. 2. We’d like slightly less tall clamps. The current clamp arrangement works, but we’d like about 1.5mm less risk of bending/bashing a screen in if the rig falls screen-side-down. This might mean either Inovativ providing slightly shorter clamps as their regular Universal clamps (which, given the shim arrangement they use, would make things much more friendly for new MacBook Pro users without making things much more difficult for others), or providing a custom version of the MacBook Air clamps. (We’ll happily beta-test). 3. It would be really nice to have shorter “ears” available for us users of 12”/13” laptops. The plate ears could easily be a few cm’s shorter on either side without losing functionality, and it would make things more flexible, lighter, and easier to deal with for those of us using smaller laptops. 4. We really dislike the DigiBase. As we mentioned, it’s too deep on a stand to be securely attached as shipped, and on a Magic Arm, it’s even harder to attach securely and be confident about its attachment. It’s also heavy and awkward. While we could easily remove the DigiBase and just screw the DigiPlate into the top of the Magic Arm, we’d lose the ability to leave the Magic Arm on while removing the DigiPlate from it, which we find ourselves doing a lot. What would be ideal: screwing an Arca-Swiss plate to the bottom of the DigiPlate, and screwing an Arca receiver into the top of the Magic Arm. If Inovativ offers an Arca plate (perhaps with the same anti-twist pin that the DigiBase has), we’d love to try it; otherwise, we’ll probably buy a generic Arca plate and receiver and re-rig this part of the setup; thankfully, with the ‘cheese plate’ design this is trivial to do and will give us an even more usable rig than it’s providing us now. This setup has very rapidly become indispensable, and apart from some quibbles, we’re keeping it and recommending it to others! GVHBA members: Make A Better Awards Entry. Earn CPD Points! 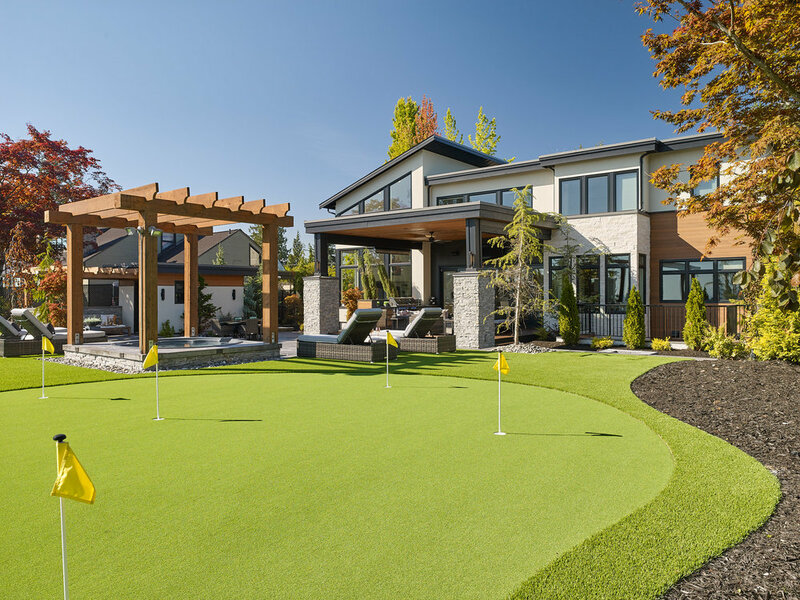 It’s a week off the Georgie Awards deadline, and we’re completely slammed putting together awards entries for many of our clients’ amazing projects, and it seems too early to be even thinking about the GVHBA Ovation Awards. (What’s that you say? There’s a world after 8:00PM on October 1? Yeah, we don’t believe it either). Yet here we are, and as some of you know, every year or so Lynn Harrison of Harrison Marketing Resources, our very own Susan M. Boyce, and I get together and present a couple of hours of tips, tricks, traps, and goodies for making stronger entries in our local building awards programs. The course we delivered last year is up on GVHBA’s e-learn, which means you can take it it and get your CPD points on a gray, rainy weekend without even having to move your pet out of the way and get out of your pyjamas. If you register before the end of the day this Monday, September 24, and use code FALL18, you’ll get 20% off this and other courses on e-learn. So, if you need those coveted CPD points and you want to improve your business and your building, go check out the other courses on e-learn as well. Think it’s scary putting together an Ovation Awards entry for your not-so-haunted house? Treat yourself to this course—it’s sure to fill your skull with knowledge. We’ll give you a cradle-to-grave look at the process so you can ghost smoothly through, demystify ‘witch’ categories you should enter, dress your project description up, and give you some good tricks so you’re more likely to end up with a whole bag full of honours at the end of awards night. Give it a boo! Congratulations on your Georgie, Hayer Builders Group! 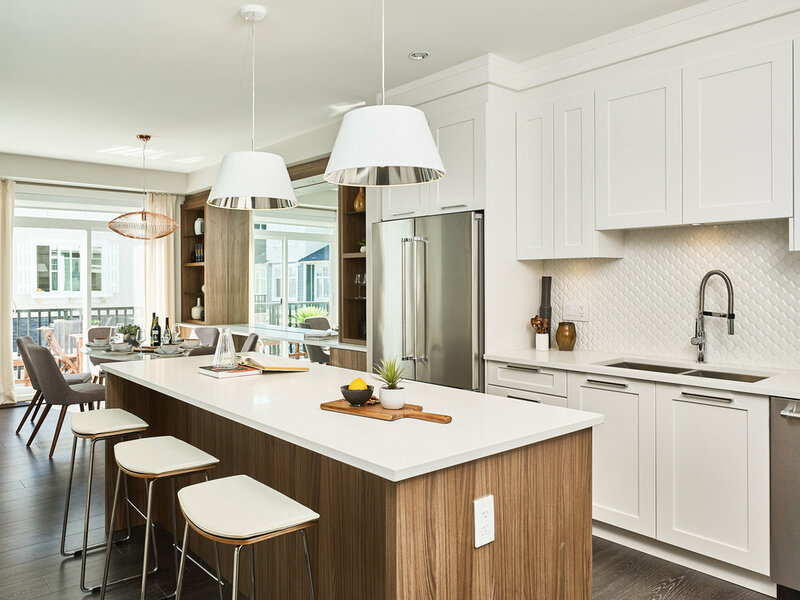 One of our most widely awarded projects this year has been Hayer Builders Group's Summit townhome project in Surrey's Panorama Heights neighbourhood. Providing uniqueness in high volume building is, as you might imagine, a tough design problem--but tough design problems almost always lead to good projects and often even more interesting photography. 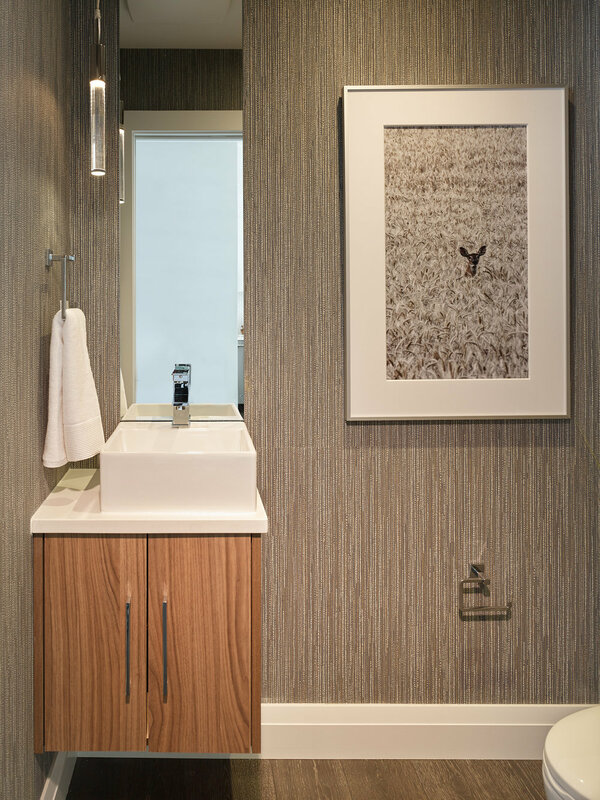 We photographed a lot of multifamily projects last year, and it's always fun to see what little touches our multifamily builders put in in order to make each project special. Hayer's Summit was full of all sorts of special touches (built-in wine fridges, kitchens overlooking living areas on a lower floor, those fabulous rooftop balconies...to name but a few), and the judges in the Fraser Valley Housing Awards, the Ovations, the CHBA Nationals, and the Georgies agreed. The GVHBA Ovation Awards Call for Entries is out, and the entry form is open starting today. A lot of our clients enter (and win!) the Georgies, and if you've in Greater Vancouver and you are a GVHBA member, you qualify for the Ovation Awards as well. 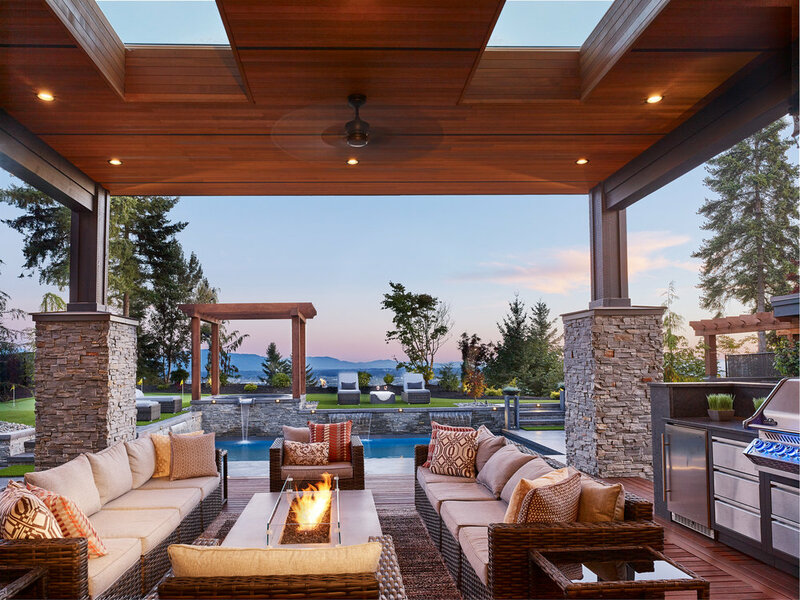 (And if you build/renovate/design residential projects in Greater Vancouver, go join the GVHBA so you can enter!) While you have until January 22 to get your entry in, if you've already entered the Georgies, you have a big head start on getting your Ovation Awards entry in way early. (If you're in the Fraser Valley, the Fraser Valley Awards of Excellence are on, and end November 15). Over the last few years, all the local housing awards have worked diligently to harmonize their entry requirements, and this makes life a lot easier for everyone. We recommend entering as many awards programs (and categories) as you reasonably can, because that's more opportunities to win. One of the questions we're consistently asked is, "I put my project in for the Georgies. What else do I have to do to put my project in for the Ovations?". The answer is: it depends on what categories you entered. Out of all our local homebuilding awards, the Ovations have the widest selection of categories (a whopping 51 this year). That's a good thing because there are lots of cool boutique categories that you can enter (sometimes with less competition), but it's a frustrating thing because...that's a lot of categories to sift through, and it's easy to get confused. 1. Is there a category that closely or exactly matches what you entered in the Georgies? A number of categories in the Ovations match the corresponding category exactly (most of the 'whole house' Custom Home, Single Family, and Multi-Family categories do). In that case, you're good to go! Just copy your photos, text, and budget from your Georgie entry, get a fresh consent form from your client (and submit one yourself, as the builder), and you're off to the races! This can go the other way as well. If you're a new home builder and you entered the marketing categories in the Georgies, you might end up being disappointed as the Ovations have but one marketing category--Best Marketing Campaign. You can't enter your logo or your sales centre in the Ovations. Similarly, the Special Achievement categories in the Georgies and Ovations are different beasts, so read the requirements carefully as you might fit easily, or you might not fit at all. 2. Is there a better, more fitting category than what you entered in the Georgies? You have some additional categories that you might want to consider entering as well as your Georgie categories--or instead. 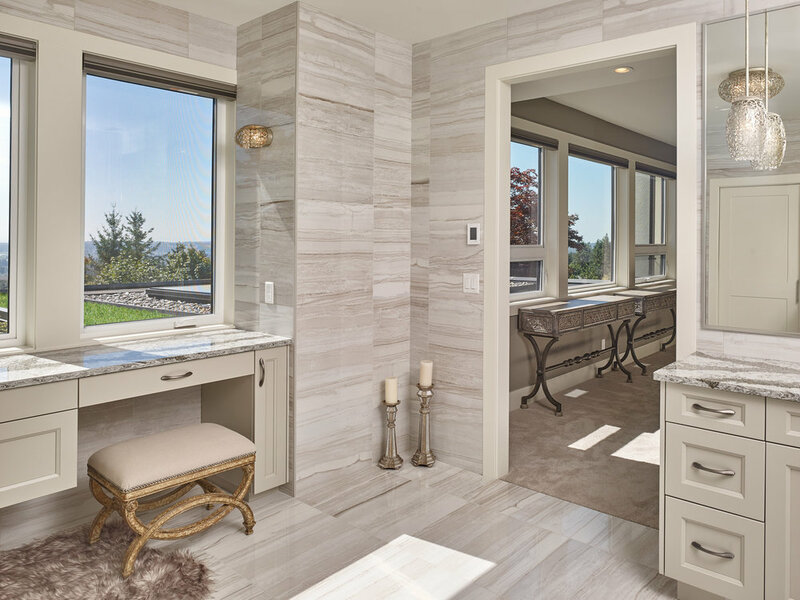 This is particularly the case for renovation projects, because the Ovations have different cost and square footage breakpoints, as well as some more options that let you be more strategic and specific about what you enter. One case we see frequently is in kitchen renovations. Say you renovated a kitchen and a greatroom. In the Georgies you have to enter the kitchen in a Kitchen category, and the greatroom in the Any Room category. We often see projects where the greatroom is a good piece of design, but it's not quite enough to be awards-worthy in its own category--but the flow between kitchen and greatroom is. If you just read that and said "Hey, that's my project! 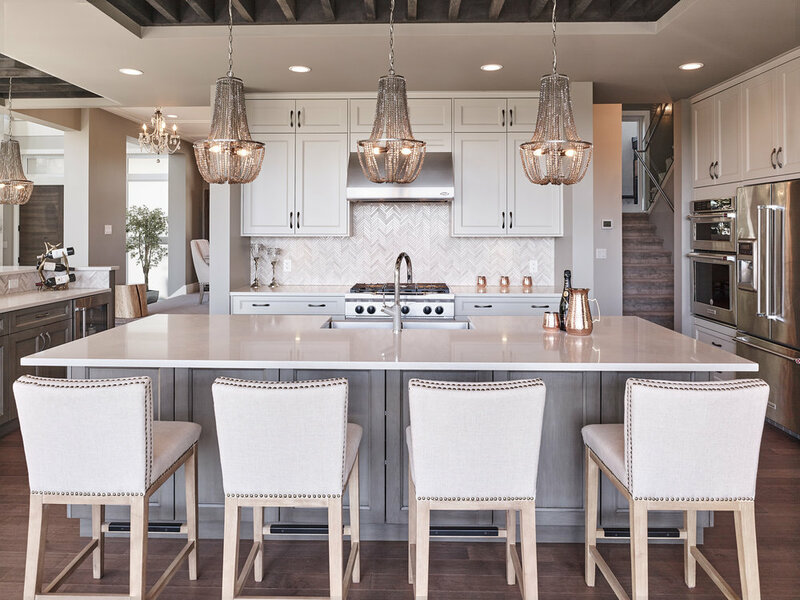 ", then you might want to consider entering the Kitchen and Greatroom Renovation category rather than simply repurposing your Kitchen entry. Doing this is going to likely require some rejigging of your marketing text, as well as a few changes in photos to include the greatroom. If you had us do your photography and/or writing, we can often do this for a nominal charge to cover reworking the text and licensing an extra few photos. 3. Are there additional categories you should enter? As I just mentioned, the Ovations have some excellent 'boutique' categories. Did you renovate a character home, or do a predominantly exterior+landscape renovation? Check out the Best Heritage/Character Home category, and the Best Exterior Reno categories. If you're a new home builder, there are some goodies for you as well. Laneway projects get their own category this year (Best Small-Scale Home < 1000sqft). We've photographed some fantastic laneway projects this year, and it's great to see this category come up. For the volume builders among you, look particularly at the Best Residential Community categories, which take a more holistic look at your development, including your amenity spaces and how your community fits into its surrounding. If you have great amenity features, these categories could be for you. In these cases, you'll likely need some new writing as well as licensing some extra photos from your Georgie Awards entry, so give us a call and we're happy to help. And if you didn't enter the Georgies, it's worth remembering that you can often use your Ovation Awards entries for the Georgies next year. Because of some quirks with the entry form, it's much easier to take an Ovation entry and reuse it for the Georgies than it is to go the other way around...but as they used to say about voting in Chicago, "enter early and often!". We have packages to help you out with your writing and photography, and we're looking forward to seeing the wonderful things you're building. Good luck in the Ovations! As of today, it's officially the First Day Of Fall. Pagans get to celebrate this with Mabon, but we architectural photographers have our own observance: the noting that between today and the Spring Equinox, Mother Nature will no longer be providing direct light on north-facing elevations. Bummer. The upside of the days getting shorter is that we can shoot twilight exteriors earlier in the day. In Vancouver, midsummer days last so long that we're often photographing well past 10 or 11pm, and packing up at midnight. Being a night owl, I rather relish this (especially because you get good twilight for almost an hour), however, for homeowners--particularly those with kids--this can be tough because it's "way past everyone's bedtime". With twilight happening closer to 6-7pm, this makes things a lot more convenient for everyone, at the cost of...fewer twilight images to be had before losing the light, and a bit more planning on our part to get everything in. So, if you have a north-facing exterior, and you need natural direct light on it, we're happy to schedule you in after May 1. Otherwise, grab yourself a pumpkin spice latte and enjoy the fall!